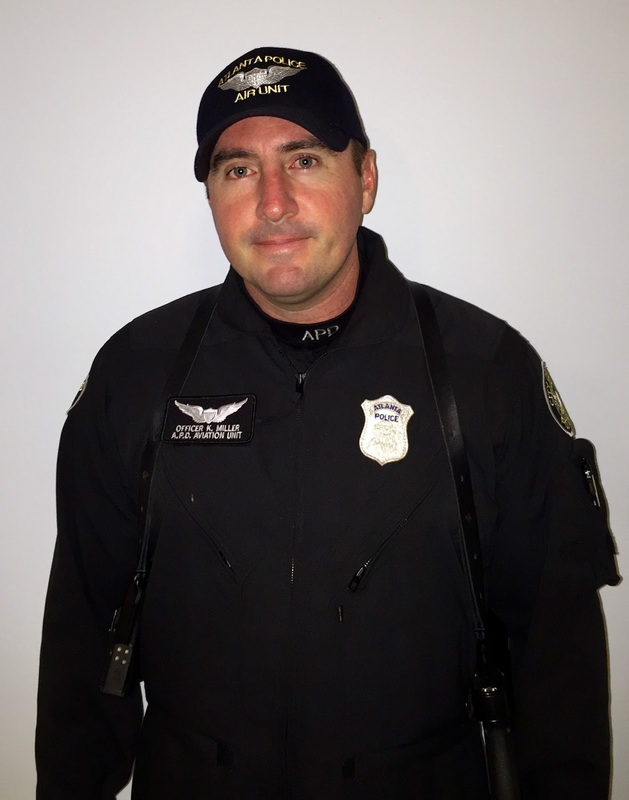 The newest member of the Virginia Highland Security Patrol is Officer Keeley Miller, who has been with the Atlanta Police Department for five years and with FBAC for two. Officer Miller began in Zone 6 as a patrol officer, but he tells us that, “almost two years ago I was assigned to the Air Unit. Now I patrol the city from the sky”. Winston, Georgia, where he grew up, is a little town about thirty minutes west of Atlanta. In fact, he and his wife Nita still live in that area and have watched a relatively quiet little town develop and grow without losing that small town feel. There he and Nita, his wife of twenty years, are raising two boys. Tyler is 18 and attends University of West Georgia and Logan is 13 years old. Soon they will be welcoming a new addition – their first daughter! Nita and Keeley also have two dogs to round out the family. A member of the baseball team at Alexander High School, after graduation Keeley attended University of West Georgia. Like father, like son? However, he did not take a direct path from college to the Atlanta Police Department. Before joining APD he owned a business with his dad and brother. With the downturn in the economy and slowdown in the construction industry, it was time to pursue a childhood dream of becoming a police officer. His safety tip for us it to always be aware of your surroundings, if you see something suspicious, report it. Also remove all valuables from your vehicle.